Mill-Max introduces a double row SMT strip socket which accepts .025"-.037" diameter and .025" square pins. This double-row connector is offered standard in 4 (2x2) up to 100 (2x50) position configurations on .100" spacing. The .276" tall insulator is manufactured with high temperature thermoplastic suitable for reflow soldering operations. Each precision-machined receptacle contains a Mill-Max #47 contact clip, rated at 4.5 amps per position. This connector is available in RoHS compliant and traditional platings. 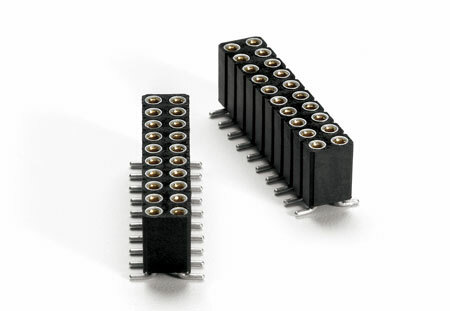 For connector configurations up to 10 positions per row, the coplanarity of the leads is .005". For strips larger than 10 positions per row, the co-planarity will need to be addressed.